Marking objects or urine spraying is a normal territorial instinct that many domestic and wild rabbits display. Unfortunately, pet rabbits that spray urine create a problem for their owners. Those who own rabbits that spray are constantly faced with how inconvenient and costly this behavior can become. There are a few tips to help prevent this behavior, but the most efficient method is to have your rabbit surgically altered. It is important to distinguish between urine spraying and inappropriate urination due to environmental or medical factors. When rabbits spray urine, they tend to spray on vertical surfaces; however, rabbits displaying inappropriate urination will generally urinate on horizontal surfaces. In addition, if a rabbit has sprayed, the urine will have a stronger odor than urine that was released inappropriately. Territorial tendencies: Intact rabbits (especially males) will frequently mark their territory as a normal instinct. Intact rabbits that are housed together will regularly attempt to mark their cages, each other, and on some occasions, their handler in an effort to display dominance. Too few litter boxes: If you allow your rabbit to run free in the house, you must provide an adequate number of litter boxes. On the other hand, it can also be beneficial to confine your rabbit to a specific area of the house that clearly provides a litter box. Owners should also consider the number of rabbits they have in one area. If too many rabbits are forced to live in a certain area, rabbits may urinate and defecate outside the litter box because the litter will easily become soiled and uninviting. Behavioral issues: Just like humans, rabbits respond to change. If a rabbit does not agree with a certain change in its environment such as a new person, new pet, hutch location change, or feeding schedule, it may start to exhibit unwanted changes in urination behavior. To avoid this problem, make sure you make changes to a rabbit’s environment gradually. Medical problems: If your rabbit usually has good litter box habits, a sudden irregularity in urination may be a sign of a threatening medical condition. In the event that you notice a significant change in how your rabbit behaves when using the litter box, take your rabbit to a veterinarian as soon as possible. The best way to avoid dealing with unwanted urination behaviors is to have your rabbit spayed or neutered. These procedures remove the reproductive organs that are responsible for the production of hormones that can play a role in territorial behaviors. Fixing your rabbit may also alleviate other behavioral problems, such as aggression or biting, that are associated with reproductive hormones. Altering also decreases the chance for reproductive complications, especially in female rabbits. If you own rabbits that you plan on breeding, you will have to be prepared to deal with urine spraying. If your rabbit is intact, try to avoid letting your rabbit run free in the house. Allowing your rabbit to freely roam the house will only set your rabbit up for disaster. 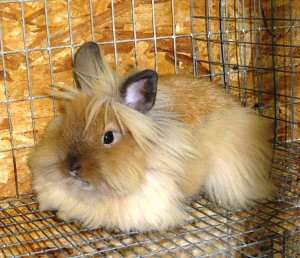 Rabbits will often spray items that do not already contain their scent. You can also house intact rabbits away from each other. Separating the hutches of these rabbits can help deter marking behavior. If you choose to use a litter box for intact rabbits, make sure that the sides of the box are high enough to prevent urine from being sprayed outside the box. In addition, rabbits tend to urinate in corners, along walls, or along borders, so you may want to cover the wall of the hutch or room closest to the litter box with newspaper or plastic carpet protectors to allow for easy cleanup. For rabbits housed in wire cages, metal urine guards may be purchased at most pet stores. These guards fit around the bottom corners of wire cages and help protect the surrounding area from urine exposure.